We’re opening the archives so that in our series we can bring readers closer to events at marathon in Košice, always progressively in years which are exactly a multiple of ten years in the past from today. Not even a train could stop the era of the northerners. According to records, 91 runners stood at the start of the marathon on Sunday, 23 October 1949, which was precisely the number that spring in Boston. There could have been more, but the organizers of the 25th anniversary of the event’s founding decided to set a qualification time for participating in the race at 3:45:00. The period between 1946 and 1956 in Košice belonged to runners from northern Europe, yet only three times in this decade didn´t a Scandinavian stand in the highest position on the podium. One of them was 1949, when Finn Martti Urpalainen, fresh off his victory at the marathon in Stockholm, travelled to Košice as one of the favourites to win. This victory in the Swedish capital had just put him in an excellent 4th place in the world rankings for 1949. Other northerners, and there were several on the course, didn’t fare so well and finished well outside the winners, although at the turnaround point the Swede Söderstrom and the Norwegian Systad were breathing down the neck of the Finnish champion. But not even Urpalainen was necessarily fated to be the winner. He was helped in this by a resourceful engine-driver of a slow train from Moldava, who, seeing the course of the race and Urpalainen by himself in the lead, speeded up the train near Barca so that the level-crossing would quickly open, and the race leader did not have to jog in place while watching his competitors draw closer. Urpalainen’s winning time in 1949 was at the same time the historically second best time at the marathon in Košice, just behind the course record of later Olympic champion Juan Carlos Zabala from Argentina, who in 1931 had won with a performance of 2:33:19. We’re happy if you find our brief glimpse into the past interesting. 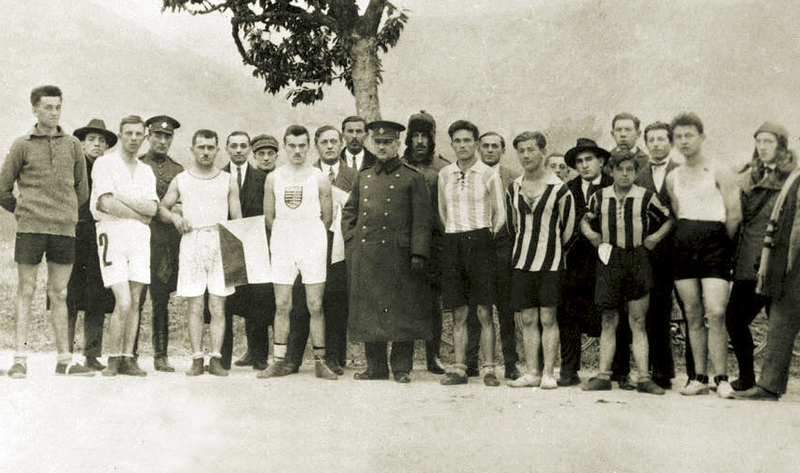 It was in the summer of 1924 that Vojtech Braun Bukovský, Košice sports enthusiast, organizer and journalist in one person, went to see the Olympic Games in Paris. The enthusiasm he returned home with was channelled into his decision to organize a marathon race, as it was this particular discipline which thrilled him the most in Paris. And so it happened that just a few weeks later, on 28th October, the day of the 6th anniversary of the establishment of Czechoslovakia, eight brave pioneers lined up for the start below the ruins of Turňa Castle and then set off in the direction of Košice, towards a then still unsuspected adventure. The first winner, local runner Karol Halla, tried defending his first place another nine times altogether, but the growing competition was against this. The very second edition already had an international line-up, and the winners laurels from the third were carried of to Germany around the neck of Paul Hempel. He was sent here by the Charlottenburg Sports Club, which still exists to this day and stands, as it has always stood, behind the Berlin Marathon. Not even the torments of war could stop the Marathon, and its continuity was preserved. The early snowfall in 1946 was a kind of premonition that the era of the Northerners was beginning. In the ten years following that snowfall, runners from Norway, Sweden and Finland won a total of eight times, with the Swede Thomas Nilsson finally setting a new course record of 2h22m06s in 1956. A great shift in the course record was achieved in 1959 by the Russian Sergej Popov, who not only won in Košice with a time of 2h17m45s, but also climbed by the end of that year to first place in the world marathon rankings. And in one more parameter Košice was number one in the world, namely in the number of participants. It may seem laughable in terms of today’s marathon mass starts, but in 1946 and 1947 Košice had the most runners finishing the race in comparison with the rest of the world: 74 in both years. Nowhere in the world could outdo Košice in this regard in 1951 either, when there were 69 finishers. In 1960 Košice acquired its own artistic symbol: a 3.5-metre high, bronze statue of a marathon runner, on the plinth below which everyone could admire the names of the winners. Just a year later the name of one of the greatest was added there. He came, he saw, he conquered. We are referring to Abebe Bikila, Olympic champion in Rome and later in Tokio as well. The population of the city at that time was no more than 80 000, but nearly 30 000 people were crammed into the stadium to see the finish, and several thousands more plentifully lined the course too. The next few Marathons were graced with other fine-sounding names: world record-holder, American Leonard Edelen won in 1963, and brilliant runners from Great Britain and the Commonwealth took turns lining up at the start, such as Bill Adcocks, John Farrington, Derek Clayton, and Ron Hill. To run in Košice meant meeting a quite demanding qualification time limit. This became history in 1980, when the Košice marathon was opened to women as well. For many years the women’s event was ruled by the German Christa Vahlensieck. Back in 1977she had set the world record of 2h34m48s in Berlin, and in Košice between 1981 and 1988 she won five times altogether. Her countryman, double Olympic winner Waldemar Cierpinski, tried repeatedly for victory in Košice, but none of his five starts here brought him that honour. He started his marathon career with his debut in Košice in 1974, and completed it here as well with his start in 1985. The year 1989 brought great changes in more than one sense. Less than two months before the Velvet Revolution, it looked like the Marathon itself was anticipating the changes in society. The traditional course going out to Seňa and back, which had awaited the runners from 1926 onwards, was replaced with a city circuit. This attracted the attention of the whole world in 1997, when the IAAF World Half-marathon Championships were held in Košice. Records were broken, with three men finishing with times under 60 minutes. The race was controlled by Kenya, and the titles were taken by Shem Kororia and Tegla Loroupe. A short time later the organizers were faced with another challenge, which was to start off the Marathon that same afternoon. They succeeded with that as well. Just two years later Košice gained another honour. The city hosted the 12th AIMS World Congress, getting the chance to present its rich marathon history and organizational abilities once again. At that time, but many times later as well, it was declared that Košice is the place continually organizing the oldest marathon in Europe. The only place with a greater tradition in the world is Boston. Attentive statisticians will surely have noticed that these marathons both have two common winners. They are the Swede Karl Leanderson (Boston 1949, Košice 1948 and 1950) and the Belgian Aurel Vandenriessche (Boston 1963 and 1964, Košice 1965). Today the Košice Marathon, which celebrated 90 years anniversary in 2014, is a colourful festival of sport and fun, attracting roughly 10 000 participants from all over the world. All those running around the extensive historical centre of this city, the first in Europe to acquire its own coat of arms from King Louis the Great in 1369, must surely admire the Gothic St.Elizabeth’s Cathedral from the 14th century and a great many other architectural gems in this metropolis. It was also thanks to this heritage and its programme of creative transformation that Košice gained the title of European Capital of Culture for the year 2013.